homes.com, tel: +65 9668 6468 to help you get the best deal. Location: 3,5,7 Pine Grove, 170 units. Finishes & Fittings: Living/Dining room - marble tiles. Bedrooms: parquet. No balcony unlike opposite Cavendish Park condo. Facilities: Swimming pool, covered car park, 24-hours security, tennis court, squash court, playground, BBQ area, gym, meeting room, sauna, clubhouse. Competitors: Cavendish Park (254 units) across the road; however Cavendish Park's 3+1 is more a 2+1+1 because the 3rd bedroom is very small. The Sierra (60 units) is the new kid on the block also with very small 3rd bedroom. Older condos like Ridgewood (464 units) and Pandan Valley (623 units) with much more spacious bedrooms and living areas and lower rentals. Occupancy rate: Almost 100%. Many Japanese and as it is walking distance to the Australian School, has many Caucasians. Contact judy@asiahomes.com to view units. Investment potential: 99 years. Rentals for 3+1 asking $5,000 fully furnished and $4,000 - $4,500 p/f, much higher than the older condos nearby. Relatively new condos attracts expats. 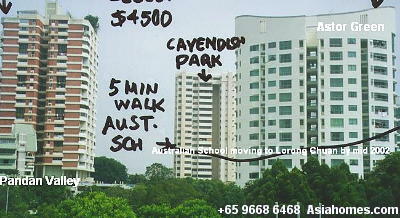 5-minute walk to Australian School. Within 10-minute bus ride to Japanese, United World College, Dover, Tanglin Schools and 15-minute bus ride to Dutch & Swiss/French Schools. Relatively new, with marble flooring. Looks clean and good. Medium density condo with 3 blocks only. Highest floor 15th. City gas, no need cylinder gas. Express Green Bus Plus to town. Shuttle to Bouna Vista subway. 3-bedroom (1,500 sq. ft) has a bigger 3rd bedroom to accommodate a single bed than Cavendish Park's 3-bedroom (1,300 sq. ft) or The Sierra's 3-bedroom (1,200 sq. ft). An area with many condos. Small maid's room with no door at entrance to kitchen. Asking higher rentals since occupancy is almost 100% and units are in demand..
"I have to attend CEHA class this evening. Why don't you ask your prospect to view the unit during lunch-time? I can't leave the keys with the security guard or anyone. You are not allowed to collect and return keys. This is Management Policy," said a harassed Realtor Madeline, the sole controller of this new Bukit Timah Condo. Big Straits Times advertisement, almost daily. 1.5 months' commission to realtors, at least 50% more than the standard. But the Management has only one girl to do the house showing and she is not even working in the Condo itself. She has to drive from another office taking around 30 minutes. She has other duties and cannot delegate and cannot keep appointments. Everytime, she has to drive to the Condo for one agent. She gets exhausted. The Company is actually wasting money on Straits Times Advertisement. What is the point of offering 1.5 months' agency commission when it is very inconvenient to show the unit? This is good news for private individual Landlords. The following are updates on what Developer-Landlords are doing. There are at least 3 categories of Developer-Landlords. Do-it-yourself Company. Their advertisement will usually state "No agents please". This is good news for private individuals as this Company feels that its properties will rent like hot cakes. It feels that its rental properties are cheap and may even increase rental while others are reducing rentals. Unfortunately, only one such Company practise this Do it yourself. Its policy will change when it discovers that more of its properties are vacant. Well-organised Company. Usually has numerous properties and a Property Development is its core business. Sends listing of properties for rent to agents to keep them up-to-date but irregularly indicating shortfall of staff. Sometimes invites agents for a free lunch meeting. Throws big Straits Times advertisements daily but do not mention "Agents Welcome". Has a leasing department with several staff dealing with rental queries and provide some backup service. Entrust agents with keys to units. Gives 1.5 months' agency commission in some new or slow-moving projects. The database of realtors (realtors book in and give name cards) specialising in residential rentals is not efficiently used to its advantage. Will need information technology. Fortunately for private individual Landlords, no weekend or public holiday viewing is allowed. However, show units in new projects may be opened or the Security Guard may have the keys. Disorganised Company. Rentals are its side-business and only one girl (usually female) is in charge on a part-time basis (see story above). The girl has to fix appointments according to her free time. Another person may open the unit. Sometimes, it has a show unit and if its office is next door, will have staff to open unit at short notice. One Company uses its phone as fax machine to receive the Letter of Intent. This indicates a lack of professionalism as big Companies have their own fax machines. The girl in charge of the Letter of Intent may or may not call back to negotiate since she is busy. Agents Welcome Company. Enlightened Developers and sometimes an older rental-developer or development not in good location. Some organised companies have a full-time on-site Manager who does viewing at short notice and calls back for feedback and response. Such units tend to be rented out faster if in good locations. An on-site Manager can probably cope with 50 units and not more but being on-site, can take viewing by realtors at any time, during office hours. Inflexible house viewing times, usually restricted to office hours. No weekend or public holiday viewing of the actual unit, although there may be a show unit. Short of staff. Single person in charge usually not free or not given authority/motivation to get more cases. Needing prior appointment of more than one day. Not able to entrust keys to more than one agent. If it has only 2 keys, only 2 agents can take out the keys to show the unit. Does not know how to broaden the realtor's base unlike some individual Landlords. Fails to turn up when appointment has been made, due to emergency duties. Difficult to contact by pager or handphone and does not respond. Unable to negotiate and needs top management decision by which time, busy realtors may as well find private individual owners or co-broke to close the case fast. There are ample lot of opportunities for private individual Owners in this shrinking Tenant's market. Just make sure you contact all the realtors focused on residential housing. Keep a database. Fax to them your vacant properties. Call them. Email us at judy@asiahomes.com. Or other Internet realtors. Give 1.5 months' agency commission and the highest occupancy rate. Be proactive and advertise as "Owners", "Full commission to agents" and you should be able to compete with the Big Boys.